The Crossover Dribble.. cross 'em up! The crossover dribble has become one the most entertaining and exciting moves in basketball in the last two decades. It's such a great feeling shaking someone out of their shoes with a quick deceptive move. 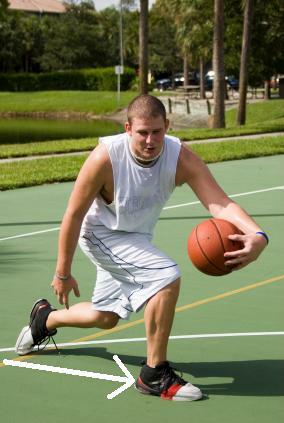 A basic crossover is simply dribbling from one hand to the other very quickly. It can be used to fake out the defender and/or change directions and driving by them. Another variation is a between the legs dribble. This way, your body protects the ball from the defender. The crossover dribble has mostly become known and revered as a tool/technique/weapon to get by your defender, sometimes leaving your defender looking pretty bad. Remember, anything you do, the ball goes with you. Therefore, the goal is to get that ball to the other side quickly, keeping it protected, and then getting yourself moving. 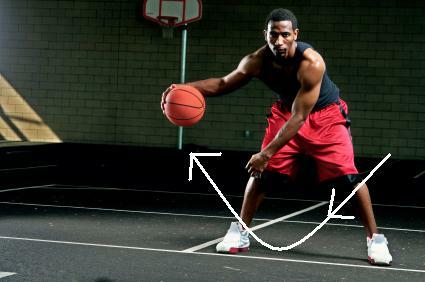 If you’re right handed, start with your right hand dribbling the ball. *Keep the ball low at all times, below knee level. The LOWER you dribble the harder it is for the defender to get a deflection or steal. *If your dribbling skills are not so good, you might find yourself losing control of the ball, especially with your weak hand during the crossover; just work extremely hard at ball handling and you'll get there eventually. There are so many variations of a good crossover dribble; feel free to be creative once you’ve mastered the basics. Don’t fall victim for over dribbling and showing off; make each dribble count. Here's a very cool video of Dwayne Wade of the Miami Heat talking about the art of the crossover; pay attention to his movements and footwork.